Having been in the USAF as long as I have, I'm pretty experienced when it comes to squadron PT programs. From flutter kicks to arm circles to body weight circuit training, I've seen many different approaches to getting a squadron physically fit. While some of these programs were pretty well thought out, quite a few had me asking, "What does this have to do with the PT test?" Generally, when I ask this question I find that a squadron's PT program is more geared towards getting people to become more active than to efficiently and effectively train them for their PT test. 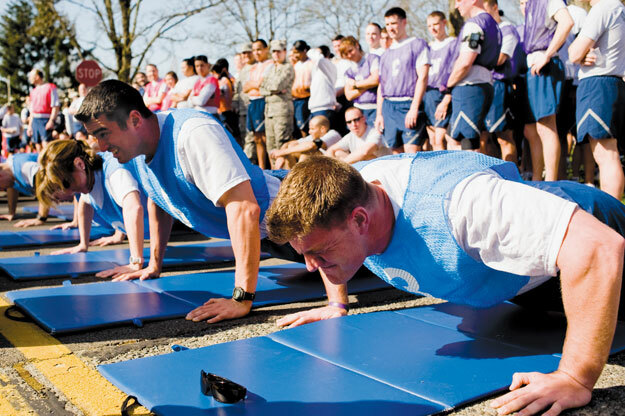 In my opinion, the priority of all PTLs leading squadron PT should be to physically condition its members so that they can easily achieve an 80 or better on their PT test. This brings me to a critical aspect of any training program: Training specificity. (1) A person's success or failure with any test depends very much on how specifically the training simulated the challenge. 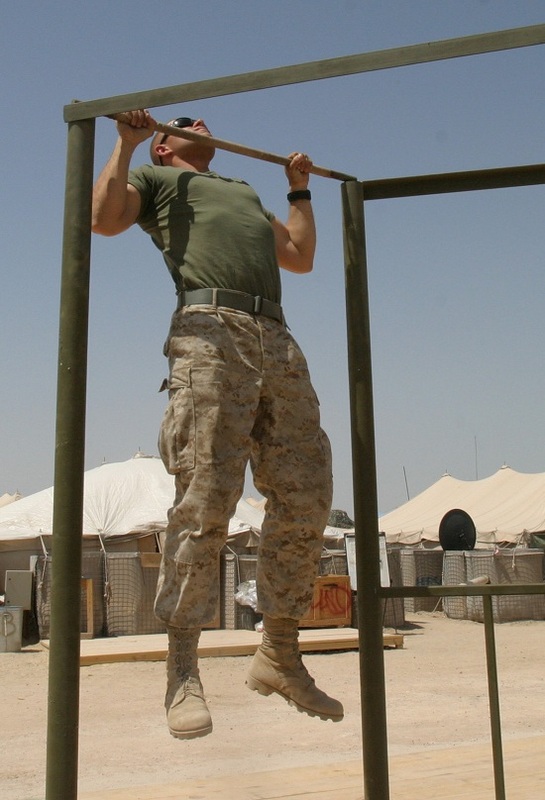 For example, doing nothing but pull-ups will not help an individual with the push-up because the muscles involved in the pull-up have little to do with the muscles involved in the push-up. Training in pull-ups will also have little to no impact on running times because an individual's upper body has little to do with running performance. So, if someone wants to improve their push-ups, then they need to do push-up-style exercises. If they want to improve their run times, then they have to run (or do leg strength exercises). One part of the PT test that PTLs cannot train for during squadron PT is the waist measurement. If you've read my blog then you know that I believe that an expanding waistline has a lot to do with chronic elevation of the stress hormone cortisol. Only an improved diet and other stress-reducing lifestyle changes (e.g., increased physical activity, quit smoking) can help an individual prevent elevated cortisol levels. While exercise is a part of a healthy lifestyle, it can only do so much to reduce stress levels. I have argued that the Standard American Diet (SAD) is one of the larger contributors to a person's overall stress levels. Why? Because the SAD diet supplies a steady stream of dietary toxins (e.g., refined sugar, vegetable oils, wheat), while lacking desperately needed essential nutrients (e.g., vitamins, minerals, protein). This causes chronic stress on the body. Aside from the negative health consequences, the side-effects of chronic stress will lower an individual's fitness potential and prevent them from getting their true PT test score. Switching from the SAD diet to a healthy one that avoids the 7 Deadly Foods allows the body (and brain) to repair itself and run more optimally. A slimmer waist and easier PT sessions will be indications that these dietary changes are working. For PTLs to truly understand my proposed squadron PT program I need to introduce some new exercise concepts. These concepts are critical for rapidly improving strength and endurance. To stimulate additional muscle strength, muscle has to be overloaded with a weight that it can barely manage. This overload creates a demand for more strength. With proper technique (and a nutritious diet) the brain will respond with constant improvements by increasing muscle strength. Max Contraction is an efficient way to overload a muscle group using only static holds, where an individual doesn't move a weight, they simply hold it still. Essentially, a trainee takes a weight and holds it stationary for more than 2 seconds, but no more than 6 seconds. If a person cannot hold a weight for at least 2 seconds, then the weight is too heavy. If a person can hold it for more than 6 seconds, then the weight is too light. 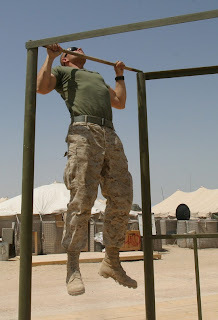 Here ia a Marine doing a Max Contraction pull-up. If this person can hold this position for more than 6 seconds then to continue to improve his strength he would have to strap additional weight to his waist with a belt. Additional weight increases the amount of load his back muscles experience creating a demand for more strength. To progress with Max Contraction simply keep adding weight (or to progress with body weight exercises add more mechanical disadvantage) so that the body continuously experiences overload and grows stronger in response. Volume is simply a high number of overall reps. In my program, beginners do 50 total reps for a given volume exercise (intermediates do 75 and advanced participants do 100 total reps). Moving from 50 to 75 to 100 total reps is determined by the length of time it takes a person to complete their target reps. If someone can do 50 push-ups in under 3 minutes then they move up to 75. If they can complete 75 push-ups in under 3 minutes then they get to move up to 100. It is probably easier for a large formation to accomplish their volume exercises broken up into several sets (say 10 sets of 5, 7, or 10 reps) by using a round timer. Participants are still doing the same number of total reps, but each set is limited to 5-10 reps. The idea is to give a person a 15-second period to accomplish their 5-10 reps and a 20-second period for rest before moving on to the next set. When each person accomplishes 10 sets using a 15/20 work/rest cycle they will complete a given volume exercise in under 6 minutes. If a person struggles to get their total reps using the correct form, have them switch to a modified version when they fatigue. Over time, as they get stronger, they should do fewer of these modified exercises, allowing them to complete all of their reps with proper form. Interval training means alternating between running and walking (or jogging) for a predetermined distance. How far an individual walks and jogs depends on the chosen distance. For example, if someone were to run 4x100-meter intervals (that is, 4 sets of 100-meter runs or walks), they would run at their test/race pace for 100 meters (which will be pretty fast for this distance), walk the next 100 meters, run the next 100 meters at their test/race pace again, and then walk the final 100 meters. Because we are primarily concerned with training for the PT test, this simple program is designed to maximize push-ups, sit-ups, and running performance. Have them drop as far as they can before they feel like they are going to drop on their face. Just before the point where they collapse, have them hold for 2-6 seconds. If they can't hold a given position for at least 2 seconds, then they went too far down; if they hold for more than 6 seconds, then they didn't go low enough. Repeat 2 more times (for a total of 3 sets of 2-6 seconds static holds). 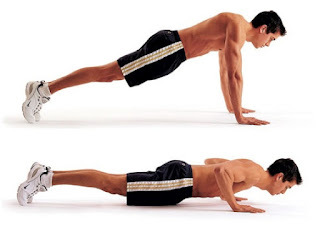 This is the bottom position of the regular Max Contraction push-up. Remove one hand from the ground (they can just raise their unloaded hand up towards their chest or they can place it behind their back). Have them lower themselves as far as they can until they feel like they are going to fall. Make sure that PERFECT push-up form is maintained. Just before the point where they collapse, have them hold this position for 2-6 seconds. If they can't hold a given position for at least 2 seconds, then they went too far down; if they hold for more than 6 seconds, then they didn't go low enough. Repeat this process for the other arm. Repeat 2 more times (for a total of 3 sets of 2-6 seconds static holds for each arm) . This is the bottom position of the one-arm Max Contraction push-up. Notice that the body is straight as a board. Here's a tutorial for one-arm push-ups that might help: http://www.beastskills.com/one-arm-pushup/. When a person can do 50 push-ups in perfect form within 3 minutes, have them do 75 push-ups next time. Once they get to 75 push-ups in 3 minutes, they get to go for 100 push-ups next time. Don't go any higher than 100 reps for any of my volume exercises. If someone cannot accomplish 50 reps within 5 minutes, have them accomplish their reps in 5 sets of 10. For each set, give them 15 seconds to complete only 10 reps and then give them 20 seconds of rest. When they can complete all reps with little difficulty, have them try to complete all 50 push-ups (with correct form) as quickly as possible. If they finish in under 5 minutes then they get to move on to the regular timed sit-ups described above. If an individual is still having problems getting all 50 reps, have them use the modified push-up (where they pivot at their knees instead of their feet) when they start to fatigue. As they get stronger they can switch back to doing all 50 push-ups with proper push-up form. Time how long it takes for people to accomplish 50 reps. When a person can do 50 reps in under 2 minutes, then they move up to 75 reps next time. Once they can do 75 reps in under 2 minutes, they move up to 100 reps next time. Don't do any more than 100 reps. If someone cannot accomplish 50 reps within 3 minutes, have them accomplish their reps in 5 sets of 10. For each set, give them 15 seconds to complete only 10 reps and then give them 20 seconds of rest. When they can complete all reps with little difficulty, have them try to complete all 50 sit-ups as quickly as possible. If they finish in under 3 minutes then they get to move on to the regular timed sit-ups described above. 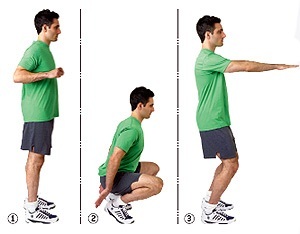 You can also use Max Contraction squats to strengthen a person's legs, which can help improve running speed. First, have them do a regular squat (with their feet together). The end point of this squat is when their upper legs (which house the quads and hamstrings) are PARALLEL with the ground. Have each person lower themselves as far as they can until they feel like they are going to fall. Make sure that PERFECT form is maintained. Just before the point where they collapse, have them hold this position for 2-6 seconds. If they can't hold for 2 seconds, then they dropped too far. If they can hold for more than 6 seconds, then they didn't drop far enough. This is the bottom position of the one-legged Max Contraction squats. Once an individual can hold a two-legged squat for 6 seconds, they can then move on to one-legged Max Contraction squats (balance will probably be an issue, so they can use a wall for balance assistance). While standing upright, have a person raise one leg in front of them while dropping straight down slowly. When they feel like they are going to collapse, have them stop and hold that position for 2-6 seconds. If they can't hold for 2 seconds, then they dropped too far. If they can hold for more than 6 seconds, then they didn't drop far enough. Repeat 2 more times (for a total of 3 sets of 2-6 seconds static holds for each leg). Here is a tutorial: http://www.beastskills.com/one-legged-squat-the-pistol/. I actually talk about the hindu squat on my blog. It is simply a full-range squat that has a person scrape their fingers at the bottom position (number 2 in the picture above). When a person touches their fingers on the floor, they will have to bend their knees to almost 90 degrees (I go below 90), which forces a person to do squats properly. It is also much more difficult to do full-range squats. Time how long it takes for individuals to complete 50 reps. When a person can do 50 reps in under 2 minutes, then they move up to 75 reps.
Once they can do 75 reps in under 2 minutes, they move up to 100 reps. Don't go above 100 reps. If someone cannot accomplish 50 reps within 3 minutes, have them accomplish their reps in 5 sets of 10. For each set, give them 15 seconds to complete 10 reps and 15 seconds of rest. When they can complete all reps with little difficulty, have them try to complete all 50 hindu squats as quickly as possible. If they finish in under 3 minutes then they get to move on to the regular timed squats described above. The last part of this PT program is sprint intervals. On a 400-meter track, sprint the straights (usually 100 meters long) and then walk the bends (also usually 100 meters). 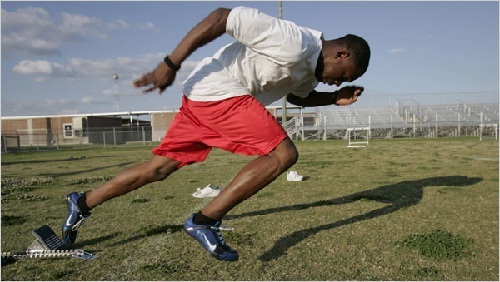 Doing this for one lap will complete the 4 x 100 meter sprints. That's it! This whole routine should take no more than 45 minutes a day and, if done three days a week, should improve all components of the PT test. How much improvement is based entirely on how much time and effort each participant invests in the program. And of course, this is just one simple approach to your squadron's PT program. There are many different exercises that you can use to build chest, core, and running strength. You can also include occasional long slow distance runs or tempo runs. You can also do occasional mock PT tests. Your only limit is your imagination. 1. Frequency vs. Intensity vs. Duration vs. Specificity vs. Volume. trainingscience.net. [Online] [Cited: August 13, 2012.] http://trainingscience.net/?page_id=217. Why is volume only set to 100 reps? For size some many studies show the balance of strength and power used creates hypertrophic effect increasing muscle cell sizes, which is lifting weight allowing 8-12 reps, and for ultimate strength, lower than 8 reps, in which increases msucle cell density. Muscular endurance studies on the other hand havent been easy to come by, but the few i have read only give a suggestions of sets and not necessarily a repition range, in which i would assume would be as many as can be done, just before failure. Would doing multiple sets, as in studies suggest 4-6 sets, of near failure rep/sets of an exercise give you better results than limiting the following sets to a number easier accomplished, such as 5-10 reps, which isnt necessarily difficult to some? Also some studies lean toward 60 seconds being the max amount of rest time given for max testosterone secretion which contributes to an increase in performance of muscular endurance. I just need to know if you have read/found otherwise justifying the 100 reps and if what i have is in theory, or even conducted, or verified. Thank you. 1) If you want maximum absolute strength, then each set should have less than 3 reps.
2) If you want maximum muscle mass (a.k.a, hypertrophy), then each set should have about 10 reps (you can go above and below that by a couple of reps, but sets of 10 seem to really well for most people). 3) If you want strength endurance (http://www.bodybuilding.com/fun/wiggy1.htm), then each set should have more than 20 reps (and very little rest between sets until you hit your target reps). This information was taken from "Practical Programming for Strength Training" by Mark Rippetoe. You can also get some more information from the following discussion: http://www.bodybuilding.com/fun/topicoftheweek8.htm. If a person wants to do more push-ups and sit-ups then they have to do a lot of push-ups and sit-ups. I decided on 100 total reps to get people to train with a number that will help them do more reps during their timed PT test. Of course, a person can do more than 100 total reps if they like (Herschel Walker does 750 to 1500 push-ups and 2000 to 3500 sit-ups every day with impressive results), but I also chose that number of reps so that a person could eventually complete their total reps in under 3-5 minutes. This keeps the entire Squadron PT workout under 45 minutes. If you want to get some good theory/research information on this stuff, check out the exceptional blog Training Science (http://trainingscience.net/?page_id=41). You can also check out this post on high-rep exercise (http://trainingscience.net/?page_id=301).